HAVE CHRISTIANS BEEN MISLED ABOUT SECOND COMING OF JESUS? Great to see that Dr Michael Brown has realised that Scripture does not support a Pre-Tribulation Rapture. Out of the ashes of the Holocaust, Israel has been re-birthed, and Jerusalem remains at the centre of world attention, again, in accordance with the prophets’ words. And around the globe, Christians are being brutally persecuted for their faith, mowed down by the hundreds and thousands. This too is in harmony with Scripture, which speak of the last days as times of great blessing and great upheaval, of great light and great darkness, or great victory and great conflict. Jesus promised that Christians would not experience the wrath of God but Scripture shows us that in the end times, God’s wrath is poured out at the Trumpet and Bowl Judgements. The Rapture occurs after the sixth seal. John saw the great multitude that no one could number of believers before the throne clothed in white robes (resurrected bodies) and waving palm branches just prior to the seventh seal being opened and the trumpet judgements commencing. Yet this is no reason to fear. 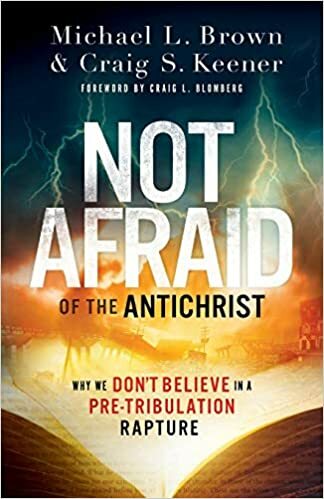 In this fascinating, accessible, and personal book, Brown and Keener walk you through what the Bible really says about the rapture, the tribulation, and the end times. What they find will leave you full of hope. God’s wrath is not poured out on His people, and He will shield us from it–as he shielded Israel in Egypt during the ten plagues. So instead of taking comfort in what God hasn’t promised, take comfort in the words of Jesus: He has overcome the world, and we live in his victory. THE RAPTURE OR JESUS SECOND COMING TO EARTH? Another great teaching by Nelson Walters (just 12 minutes) on what event Jesus spoke about in Matthew 24: 29-31. It is clearly a picture of The Rapture not Jesus physical return to earth to rescue Israel described in Revelation 19:11-15. Conclusive evidence for a PreWrath timing of the Rapture.